On January 25th, Alabama had planned to execute a man who cannot remember the crime for which he had been sentenced to death. Vernon Madison is 67, and has spent half of his life on death-row for the 1985 murder of a police officer in Mobile, Alabama. Madison has suffered a series of strokes, which have led to the development of vascular dementia. He is legally blind, incontinent, cannot walk independently, and suffers from slurred speech. Vernon Madison. Photo courtesy of EJI. Madison’s execution was planned for 6 PM on January 25. The Supreme Court intervened at 5:30 PM, issuing a temporary stay. Two and a half hours later, the stay had been granted while the court decides how to proceed with the appeal from Madison’s attorneys at the Equal Justice Initiative. Madison isn’t the oldest person on Alabama’s death row: Walter Moody, Jr., is 83 years old, and has been on death row for 20 years. Charlie Washington is 70, and has been on death row for 14 years. Last year, Alabama executed 75-year-old Tommy Arthur. Madison isn’t even necessarily the sickest man on Alabama’s death row. 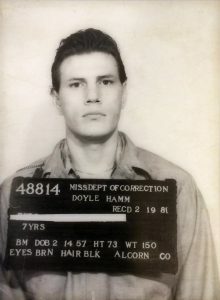 Doyle Lee Hamm, who is scheduled to be executed on February 22, is 61 years old. Hamm has been on death row since 1987. When he was sentenced to die, Alabama was still using a yellow-painted electric chair, ghoulishly nicknamed Yellow Mama, to kill people. Doyle Lee Hamm, courtesy of MS DOC. Hamm has also been living with cranial and lymphatic cancer for four years. His attorneys have argued that, since treatment for his cancers has compromised his veins, attempting to execute him via lethal injection would be cruel and unusual. Hamm received radiation to his skull for his cranial cancer, but doctors discovered a number of abnormal lymph nodes in his abdomen, chest, and lungs. Last year, a biopsy of his eye tissue revealed that the cancer had spread. Hamm’s longtime attorney (and former Southern Center intern) Bernard Harcourt invited Dr. Mark Heath, an anesthesiologist and professor of medicine at Columbia University, to examine Hamm. Heath was not allowed to bring any medical equipment into the prison; they had to improvise and use Harcourt’s tie as a makeshift tourniquet in order for the doctor to examine Hamm’s veins. Heath found that there was only one potentially usable vein on Hamm’s body — on his right hand — and even that vein was highly susceptible to rupture. The inability of prison personnel to swiftly and properly inject the lethal drugs could “cause Mr. Hamm to become paralyzed and consciously suffocate,” Heath said. There’s ample evidence that this can happen in the course of an execution. In 2014, government officials and witnesses in the Oklahoma death chamber watched, for 43 minutes, as Clayton Lockett convulsed and writhed in pain, attempting to lift himself off the gurney and out of his leather restraints on more than one occasion, eventually managing to utter “I’m not,” and “something’s wrong.” His vein had ruptured as prison officials attempted to administer the lethal drugs. Last November, 69-year-old Ohio death-row inmate Alva Campbell Jr. ― who has been seriously ill for a number of years ― was poked and prodded at by prison officials and medical professionals as they labored to find a suitable vein to inject the lethal drugs into his system. Journalists who were witnesses to the execution said that prison staff first attempted to find a suitable vein in each of Campbell’s arms, twice, and then tried a vein in his right shin. At one point in the process, Campbell began to cry. After more than two hours, his execution was called off. He was the third US citizen to earn the dubious distinction of surviving their own execution. Hamm’s execution was stayed earlier this month by U.S District Judge Karen O Bowdre, but on February 14th, the 11th Circuit Court of Appeals granted Alabama’s emergency motion to vacate the stay. The 11th Circuit also ordered the appointment of an independent medical examiner to examine Hamm and to announce the findings of that evaluation no later than February 20th.